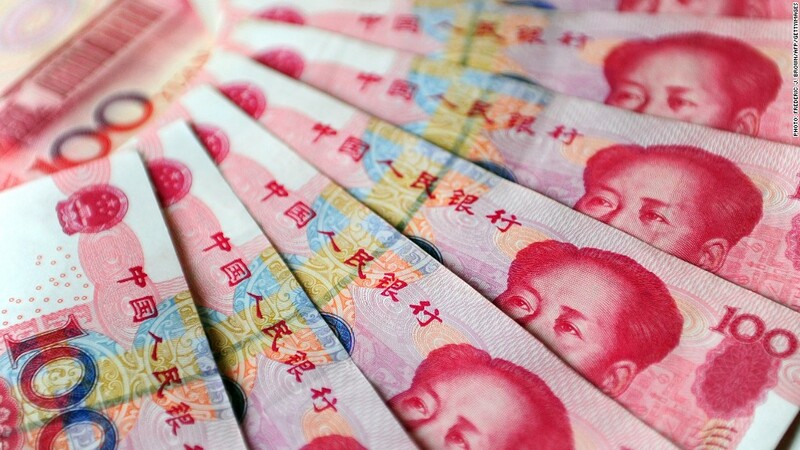 Investors will soon be able to buy a British government bond issued in China's currency. China's bid to turn its currency into a global heavyweight got a boost Thursday with news that Britain will become the first Western nation to borrow money in yuan. The U.K. government has appointed three banks -- Bank of China (BACHF), HSBC (HSBC) and Standard Chartered (SCBFF) -- to sell the first non-Chinese sovereign bond in the currency. Proceeds from the sale will be added to the U.K.'s official foreign currency reserves, worth just over $100 billion. Borrowing to finance government spending is carried out exclusively in British pounds. Most countries hold their reserves in U.S. dollars or euros. The U.K. is no exception, although it does have smaller amounts of Japanese yen and Canadian dollars. Investors will be given more details about the U.K. bond on Monday. The first sale is likely to be relatively small, raising perhaps the equivalent of just $300 million. But if other countries follow suit, the yuan will gain new stature in global currency markets. Beijing has kept tight control of the yuan in the past, limiting money flows in and out of the country and holding down the exchange rate as a way to boost manufacturing and exports. But it has taken several steps in recent years to relax these restrictions, agreeing to deals that allow the currency -- also known as the renminbi -- to trade directly against the U.S. dollar, pound, Australian dollar and the yen. In March, it also allowed the yuan to trade within a wider band. Governments and banks are falling over themselves to cash in on what could become an enormous offshore financial market. London is hoping growing volumes of yuan trade will bolster its position as the world's premier center for foreign exchange dealing. Official figures show London trading in yuan averaged $25 billion a day last year, up 50% from 2012.